Life is full….take more time to see HIM in everything that surrounds you. May you encounter His divine blessings on every turn this next week…as you journey on with HIM. Know that though you may feel rejection from others, even if someone in your life walks away, or pushes you out…know that God will never push you out, walk away, nor will He ever reject you. He went to a lot of trouble to get your attention. Look at the sky He created with such a grand display of colors….just today….all for you. Give Him your undivided attention for once. Take your eyes off those around you that selfishly use you….put your eyes on Him and your complete trust IN Him. He will never fail. And as you are riding along….thank Him for the view. This entry was posted on Sunday, April 27th, 2008 at 10:16 am	and posted in Country Life Messages, faith. You can follow any responses to this entry through the RSS 2.0 feed. Oh, I love this!!! 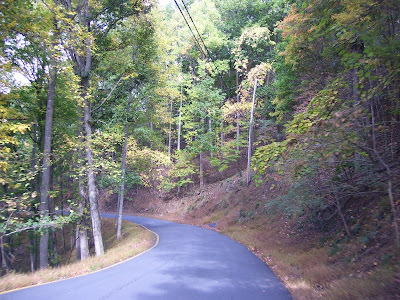 This picture reminds me of a road that we used to take when we lived in Leeds, Ala. Oh how magnificent is the creator!!! How I praise Him on this His day!!! So beautiful Our God is sooo amazing. So awesome my friend, praying for you to enjoy the view all the days of your life. I love you my friend. This is so beautiful and such a great reminder to keep our focus on God and all He has given to each one of us. How was the birthday party for your niece this weekend? I pray it was a great success.Have a great week! “Put your eyes on Him and your complete trust IN Him. He will never fail.” Ah, Angie, I needed this tonight…bless you!